Since the flu affects so many people each year it becomes a very expensive illness. Days of work missed and treatment for additional medical problems caused by the flu are just a few of the economic factors that come into play. Besides that having the flu is a fairly miserable time! The influenza vaccine was discovered through clinical studies, and there are still ongoing influenza vaccine clinical trials to discover better, more efficient ways to prevent and treat this disease. If you are susceptible to getting the flu each season please review the list of current influenza vaccine clinical trials and contact us if you are interested in participating. The influenza vaccine is a vaccine that was developed to help protect people against the influenza virus. It is also known as a flu shot. Since the 1800’s pandemics of the flu have been documented. Today the influenza virus is estimated to kill 250,000 – 500,000 people each year. It is especially harmful to young children and those over age 65. 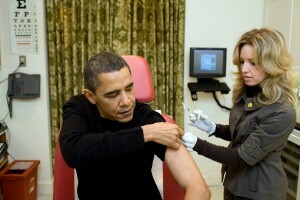 The influenza vaccine was developed to help prevent the disease. It is administered either through a shot or by nasal spray. Each year new strands of the influenza virus develop. The influenza vaccine needs to be updated each year to make sure it can kill new strands. How Do You Treat Influenza? The vaccine for influenza is still the best way to prevent contracting the illness. Since the flu is viral, antibiotics are ineffective. Influenza vaccine treatment lowers the incidence and symptoms of the influenza virus. Although the vaccine may cause mild flu-like symptoms for a few days, it will help prevent a full-blown breakout. Drugs such as neuraminidase inhibitors and M2 inhibitors may also be prescribed to treat the flu. Influenza vaccine treatment is highly recommended for those age six months to age five and those over 65.